What’s really killing King Coal? Rick Perry wants to save coal from solar and wind, but natural gas is the real culprit. This Saturday will mark Trump’s 100th day in office. In collaboration with our partners at Climate Desk, we took a look at what his administration has accomplished and what the implications are for climate change and the environment out West and across the country. Read the rest here. Rick Perry, Secretary of Energy, is worried about coal. Specifically, he’s fretting about coal-fired power getting bullied off the electrical grid by “regulatory burdens” and incentivized renewable energy. In an April 14 memorandum to his chief of staff, Perry brooded over the “erosion of critical baseload resources” — power sources like coal plants that send a constant, 24/7 stream of juice into the grid — and the “diminishing diversity of our nation’s electric generation mix.” He called for a review of the situation. Perry should know better. 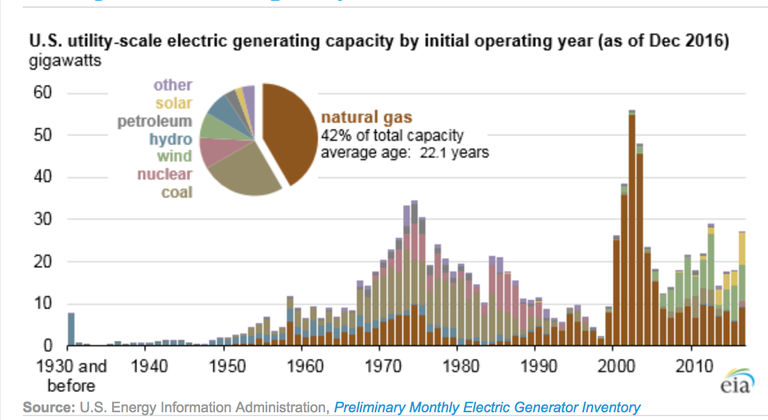 As coal fades, the electric generation mix is getting more diverse, not less. Baseload power sources, like coal and nuclear, are dying out not because of regulations, but the market place and new technologies are transforming the electric grid. And while government policies have encouraged development of sources of alternative energy, the biggest beneficiary — and the most significant factor in coal’s demise —has arguably been cheaper, abundant supplies of natural gas. 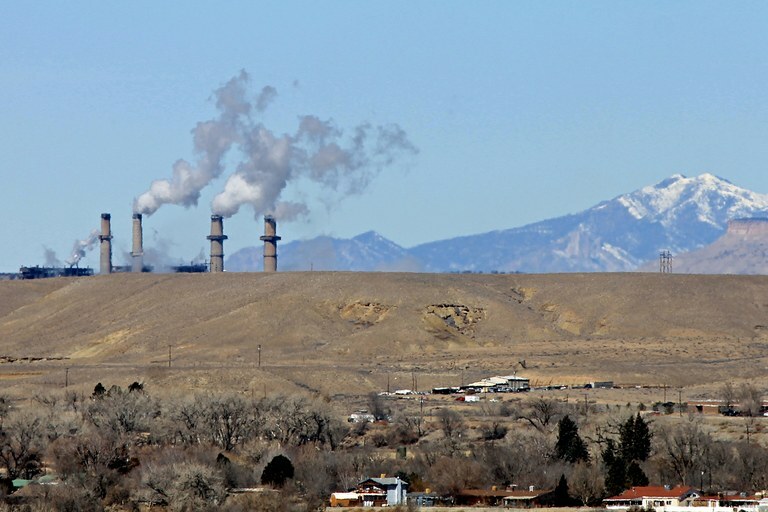 Smokestacks of the San Juan Generating Station in northwestern New Mexico. The plant's future looks dim after its owner, Public Service Company of New Mexico, announced it hopes to go coal-free by 2031. Judging by Perry’s memo, and by much of the Trump administration’s rhetoric and actions during the first 100 days, they yearn for a time when such memos were pounded out on manual typewriters and when factories and other big facilities demanded a constant flow of electricity delivered on a predictable schedule. The giant centralized coal power plants, as well as hydropower and nuclear sources, that colonized the West were perfect for the task. Once a coal plant is up and running, the flow of energy it provides is rock-steady, and since the fuel can be piled up nearby, it tends to be reliable, even if it does emit greenhouse gases, acid rain-forming sulfur dioxide, and other pollutants. But laptops and cell-phones have replaced the typewriters, and the factories have mostly gone away. Air conditioners, electronic gadgets, and even electric cars now make up the bulk of the electrical load, and gobble power on a hard-to-predict schedule. Intermittent sources of power like wind and solar only make it harder to figure out how much energy is needed at a given time. In order to “follow the load,” or respond to ups and downs in demand by increasing or decreasing the power supplied, grid managers need flexible power sources. Coal plants take hours to start up and adjusting output is difficult and inefficient. Natural gas, on the other hand, is agile. A gas turbine, which resembles a jet engine hooked to a generator, can be fired up within minutes when needed. Combined cycle natural gas plants, which use “waste” heat from the gas turbine to fire a steam-powered turbine, can be adjusted and also run consistently and steadily, providing the baseload power that coal once provided. Natural gas also releases about half the carbon dioxide per megawatt-hour as coal when burned, and virtually none of the other particulates or pollutants or solid waste (the production of natural gas is a different matter). So starting in the 1990s, utilities went on a natural gas power plant building spree in order to increase the flexibility of their grids. As a result, natural gas plants can now produce almost twice as much energy as the nation’s coal plants: 42 percent of the country’s energy capacity, compared to coal’s 24 percent. But, for years, most of that capacity went unused except as emergency backup power, largely because natural gas was expensive and more difficult to transport and store on site. Enter the federal government, which has long pushed policies that encourage natural gas extraction, from tax credits and deductions, to loosened regulations and funding for development of new technologies. Today’s Department of Energy — led by Perry — was created in the 1970s as the Energy Research and Development Administration to promote “unconventional gas research.” The Windfall Profits Tax Act of 1980 sparked the coalbed methane (natural gas) boom in the late 1980s by offering sizable tax credits to drillers going after unconventional oil and gas. A1988 Environmental Protection Agency determination to exempt oil and gas wastes from federal regulation also paved the way for a boom. When, in the 1990s, the “Father of Fracking,” George Mitchell, set out to crack the Barnett shale formation in Perry’s home state of Texas, he had a lot of help from the feds. Both the federally funded Gas Research Institute and the DOE worked with Mitchell to come up with the drilling and hydraulic fracturing techniques necessary to extract natural gas from shale formations, and the DOE developed the diamond drill bits that enabled the drilling. As utilities built more natural gas power plants, demand for the fuel increased. So drillers used Mitchell’s methods to go after previously unrecoverable gas in the Bakken shale in North Dakota and the Marcellus shale in the East. Again, federal largesse, in the form of billions of dollars annually in tax credits and regulatory relief, fueled the boom. Natural gas production shot up beginning in 2006 as a result, and prices fell. Today the U.S. produces 50 percent more natural gas than it did a decade ago, while the cost of that gas has dropped by half. Utilities are shifting from using natural gas as a backup power source to a baseload power source that can replace coal. If Perry’s analysis is as rigorous as he promises, it will likely find that this flood of cheap natural gas — helped along by burgeoning solar and wind — has cut the electric power sector’s use of coal by half in the past 11 years. Environmental regulations play only a minor role in driving more utilities to give up on those dirty old coal plants. Just last week, the formerly coal-loving Public Service Company of New Mexico announced it plans to go coal free by 2031, regardless of any regulatory rollback. Unlike Perry, the utilities that are retiring their coal plants aren’t worried about how to replace the lost power. The existing natural gas generating capacity, along with the massive buildup of solar and wind, is more than ample. For example, California has so much new solar that it has had too much power pumping through its grid at times this spring, and had to curtail – or throw away – some. The state’s grid operator is working to expand its grid so it can sell some of this extra power outside the state, and buy wind and solar from other states to smooth the ups and downs of in-state renewable sources. 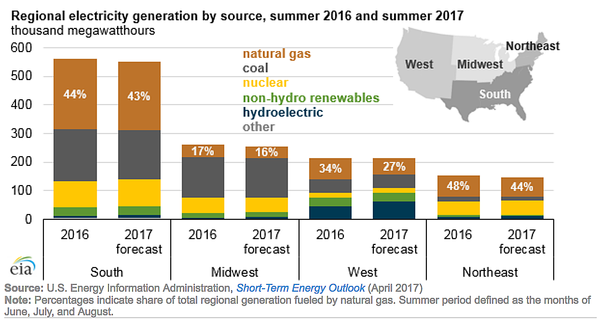 Natural gas is losing a bit of ground in the energy mix this summer thanks to a slight uptick in prices, but it mostly will be replaced by hydropower, abundant after the wet winter, not coal. Then there’s Perry’s home state. Beginning in 2001, the year Perry became governor, wind power underwent a boom. Now, thanks in part to the very same sorts of federal tax credits, state requirements and incentives that Perry’s memo frets over, Texas generates more power from wind than any other state. In January, Texas received 17 percent of its power from wind, 42 percent from natural gas and 31 percent from coal. Natural gas and wind are winning the competition with coal there, too.